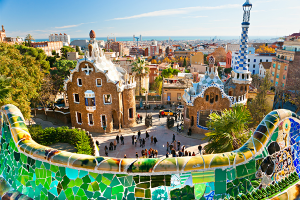 What you should know about Barcelona? Why is Barcelona the right destination? Barcelona, one of the best weather conditions of Spain. Barcelona, between mountains and sea. 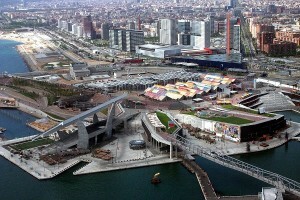 Barcelona, easy access with international airport and with its important harbor. 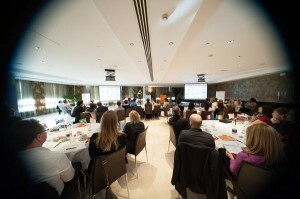 Barcelona, the best infrastructure to host any kind of meetings. 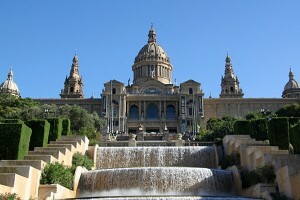 Barcelona, a cultural city with a rich heritage. First of all, the incoming destination is the city with the largest number of UNESCO World Heritage Sites all around world: in total nine of the UNESCO sites are located in Barcelona. It’s also the home town of the Catalan architect Antoni Gaudi (1852 to 1926) who greatly contribute to the construction of this cultural heritage, especially with his masterpiece the atypical church “La Sagrada Familia”, the most visited monument in Spain. In total seven of his creations are listed on the UNESCO heritage in the Catalonian region. 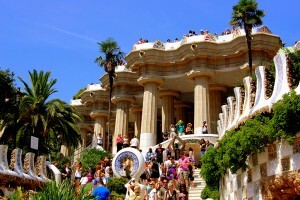 The seven buildings are Parque Güell; Palacio Güell; Casa Mila; Casa Vicens; La Sagrada Familia; Casa Batlló and the Crypt in Colonia Güell. In Parallel, the localization held several international events, like the world exposition in 1929, the Olympic summer games in 1992 or the Universal forum in 2004. Best of all, RTA is official sales agent of FC Barcelona, so we can offer you tickets to see live one of their vibrant matches at Camp Nou. 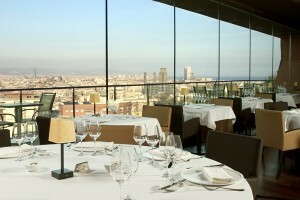 Located on the Mont Juic, “El Xalet” is an exceptional restaurant, which opened in 2004 and offers fantastic views over the city of Barcelona. 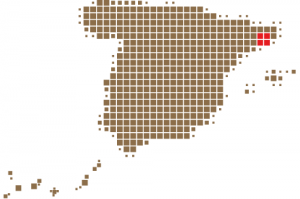 El Xalet is well known for its cuisine, a fusion of Catalan cuisine with international influences (mainly Japanese). A special feature is the hall “Giratorio“ which takes the majority of the guests at tables on a slowly rotating platform space so that each and every guest that comes can enjoy the wonderful views while eating. After lunch we will take you to the open air Museum “Poble Espanyol” where an exciting Team Building activity is ready for you. Together as a team you build “Castells”. 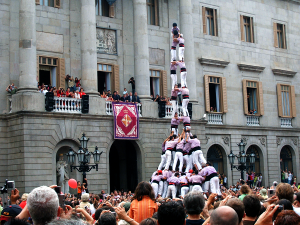 Castells are human pyramids that are built in Catalonia traditionally at numerous festivals. The participants, called “Castellers” thereby climb respectively on the shoulders of their sub-people until a certain height is reached. As a group you are going to build such towers as well and learn as a team to trust each other. The fiat 600 was our limousine of the 60’s. 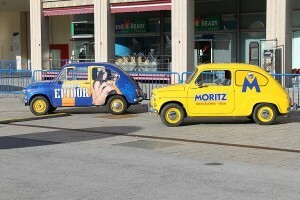 Now we are launching it with the support of MORITZ Local Beer Brand. Can you imagine driving around Barcelona at night in one of these cars, with designated stops to enjoy the best tapas in town? 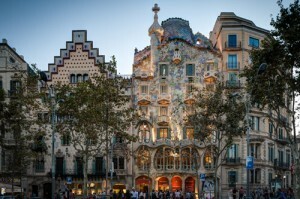 Around the elegant Eixample area and the racy Raval Quartier. Have dinner at Moritz Factory & Restaurant and Velodromo Restaurant which was reopened in 2012 by Moritz and Carles Abellan, renowned chef with a Michelin star.